You must be a member of the Istanbul Coffee Lovers Group to attend this activity. Would you like to join this group? 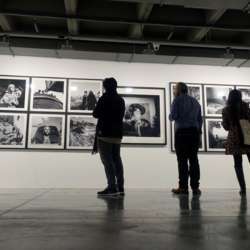 In the exhibition “Yıldız Moran: A Mountain Tale”, Istanbul Modern Photography Gallery presents the works of Yıldız Moran ( Protected content ), Turkey’s first academically trained woman photographer. Moran, who was active in the Protected content , is one of the most important photographers to have emerged from Turkey. The artist dedicated 12 years of her life to photography, from Protected content 1962, and greatly contributed to the photographic approach of generations that followed her. In her photographs of Anatolia in particular, Yıldız Moran carved a unique area for herself by interweaving love of humanity, artistic sensitivity, and photographic intuition. This impressionistic aesthetic laced with lyricism is the most important feature of Moran’s photographs, in which she careful merged the people she photographed with the land they inhabited. Encompassing not only the approach to photography of her period but also the new artistic views of our age, the artist anticipated the photographic perception of our time years before it took shape. Today, her photographs attract the attention not just of the photography experts but also of art enthusiasts in Turkey and worldwide.